Wedding dresses are the most expensive dress of our life which we usually wear once. And Rest of the life they just accommodate space in our wardrobe. But now we have online stores that buy wedding dresses and pay us the reasonable price. As per the study by LYST and e-commerce website an average bride spends around $998 on her dress. Which is still a lot of money. 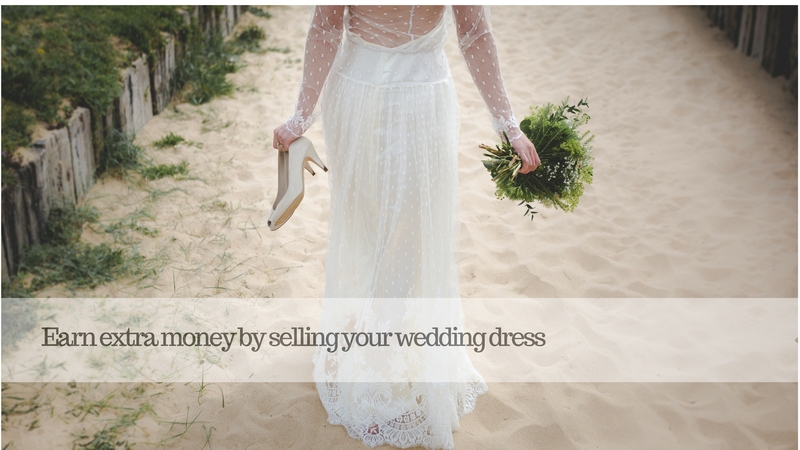 So if you think you want to make some extra money by selling your wedding dress then there are lots of websites which we are going to discuss. Important steps to review before selling a wedding dress. That will get you a better price. What is the best way to sell a wedding dress? Probably we all are not expert in this. So in order to get the best deal, we have prepared a checklist for you. Which would help you to decide where and how to sell a used wedding dress. This is the most important factor which can low down the price of your dress so please ensure condition should be good. Some of the condition we can improve our self whether some our out of our hands like damage. this also includes how old your dress is irrespective the dress condition. The best price you can fetch at the same year when you bought. And after 3 years it would be difficult for you to sell. While listing your website to any website it is important to provide all the details and description so that it is easy for the buyer to choose. E.g Size, Designer, Detail description of style, Ball Gown Skirt, A-line, Flared, Trumpet and Mermaid skirt. These details provide the true picture to the buyer and reduce the difference between what they are looking and what they are going to get. Do not use blurry or faded images while listing because it does not matter how good your dress is if your images are not good chances are buyer will overlook your listing. Most of the buyers only search dress to best sellers. So try list your dress on all best sellers. like white and ivory and plus sized. A reasonable price has higher chance to sell as compared to the dress which has a higher price. Now how to validate what is the reasonable price of our dress. Some website owners have provided the calculator to check the worth of our dress. Check your price at Preownedweddingdress calculator. After validating all these information now the next step is where I can sell my wedding dress? Here are lists of websites where you can sale your wedding dress. This website provides two packages for selling with multiple features, Standard and Premium. Buyer pays for postage charges whereas seller is responsible for shipping through registered post. Standard: – This includes the feature like Unlimited free edits, Live Viewer statistics and you can add photos up to 4. $20 we need to pay for the standard. And this is a one-time charge. Premium: – This feature includes all the features fo standard and has some additional benefits like Home page gallery, Bigger images and you can add up to 8 images. For a premium, they charge $30 which is a one-time listing fee. You will get the refund in case if the dress does not meet the requirements as per the listing. This website also doesn’t’ charge any commission but they have fixed listing fee as per the category. Here are the charges. The website claims that a listing receives almost 2000 views in 70 days of its listing period. they also provide an additional feature to identify your shape and select the dress accordingly. This website is to buy and sell used clothes of luxury brands through Mobile App. Listing is completely free whereas they charge 20% on selling. Buyers are responsible for shipping charge. This website allows you to sell many categories like branded shoes, handbags, Jewelry and party wear. This is an Ireland-based website which provides two categories in the listing Regular and Premium. Where they charge 24.95 and 34.95 Euros for 36 months. Apart from wedding dress they also provide an additional category of Bridesmaid and Accessories. For which they charge 5 euro each for 36 months. If you are unable to decide the price of the dress. Just email the details and they will get you the estimated price. Tradesy is also the best way to sell a wedding dress online. They charge $7.50 flat fee on the sale of less than $50 whereas they charge 14.9% if it is higher than $50. You can collect your payment using Paypal, debit card or ACH Transfer. They don’t charge any commission on sale but they take $19.50 per dress one-time fee for one year. One of the renowned website for selling old wedding dress. It’s not limited to wedding dress but it allows you to buy anything related to the wedding. Like wedding cake, centerpiece, makeup and much more. The website is highly reputed due to the listing and item authentication process. They verify all the listing physically before it is approved for sale. they charge 25% commission on all sales apart from $25 listing charge. This is quite expensive but still worth as per looking their sale and listing process. This website is about to share and gain the idea of all the things related to marriage. Like rings, makeup, flower, Cakes, and Honeymoon. But they also allow selling the wedding dress. This website would be a treasure for those who are planning to get married. It’s more like a forum for where you can discuss anything related to Marriage. If you are looking place which provides a free listing and no commission then Smartboutique is best for you. But they also provide a premium package which is an optional service. Premium package has additional features like putting your listing on the home page, Better search results and you can see how many items of yours have been viewed. They charge a one-time listing fee of 14.90 euros and listing is complete within 24 hours of the payment. You can upload maximum 7 photos. Unlimited free listing changes are allowed. Bravobride running their business since 2008. So they have pretty good experience and they provide a free listing to all wedding items except wedding gowns. For that, they charge a flat fee of $19.95. the website is fully loaded with wedding items like Flower basket, Jeweled Lantern Centerpiece, Wedding jewelry, rings and custom wedding sets. Ingrid – Thanks. I’m planning on trying different varieties of winter squash all through the season. I wish people would just mind their own business when it comes to judgment about food, but unatytunfoelr, that doesn’t seem likely to happen so it’s good you figured out a way of dealing with it. I think the admin of this web article is really working hard in support of his web site, since here every material is quality based information. I am not even kidding, you are always learning new things and trying to better yourself, which is awesome. Beyond useful info. I truly think this page needs much more consideration. I will probably be again to read much more, thanks for that info. Awesome page. Just wanted to say fantastic write up! Some nice points there. Interesting post. I really like your post. I am trying to discover more on this field. I bookmarked it to my bookmark site list and will be checking back soon. i really appreciate your favor for doing this. I never discovered any attention-grabbing write up like yours. I truly appreciate this article. Certainly a lot of information to take into consideration. magnificent posts and thought|Thanks for expressing your own page post I�d constantly stick to|Thank you almost all for the details. Is there new information. Thank you! For any new update keep checking our blog usually we update on daily basis. great insight. In my view, if all webmasters and bloggers made just right content material as you did, the web might be a lot more helpful than ever before. Very nice blogs. I was reading your write up and girlfriends stupid kitten threw a glass all over my brand new Iphone! I really appreciate your efforts and I will be waiting for your further website thank you once again. My professor told me they really like your articles page. Thank you for putting this up. I truly appreciate your efforts and I am waiting for your next post. Well written! Extremely great short blog. it is like you wrote the book on it or something. You have made my day! You should be thanked more often. So thank you!! I found your pages via Google while searching for a related topic, your post came up and I am so glad it did I will be subscribing to your feed. Somehow you make time stop and fly at the same time. Such a deep answer! On a scale from 1 to 10, You are an 11.